What is this phenom called Comic Con? To me “The Con” is the place where I can get my fan-geek on without being judged as I soak up the latest on Star Wars, Superheroes, Hobbit, True Blood, Dexter, Big Bang Theory, Vampire Diaries, Glee, Twilight, Torchwood, Dr. Who (list too long to continue) and of course fantastic YA and MG authors/books. It’s an awesome platform to promote your work. As a special treat today, I have an interview with one of this year’s Comic Con attendees, Cameron Rose. What is the pull of Comic Con for you? I like being a fan of what some consider “geek culture.” Aside from seeing movies, TV shows, and reading comics there’s really no other way than Comic Con to celebrate my appreciation for the huge umbrella that is popular culture in one place. There is nothing quite like being there in person when something exciting happens like Joss Whedon announcing there will be a DOCTOR HORRIBLE 2. What were the best costumes you saw this year? The best, and frankly most exciting was seeing Garrus and Shepard from the MASS EFFECT video game series. I saw more people dressed as the 11th Dr. Who character than anything else. There were at least three really well put together Dalek costumes from the Dr. Who series. 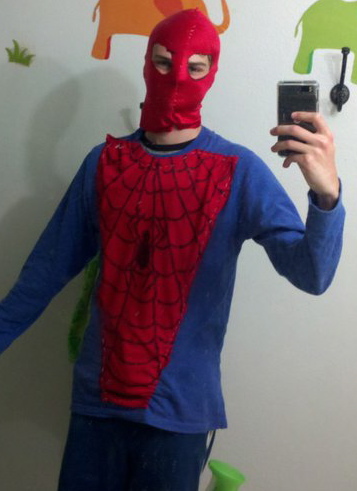 I was Spiderman, my personal favorite superhero, but my goal was to make the worst Spiderman costume possible. I think I succeeded. What were your favorite panels? THE best panel was Joss Whedon. He’s my favorite writer and he’s made all my favorite shows like BUFFY THE VAMPIRE SLAYER and FIREFLY. (RIP FIREFLY) What made the panel so great was its format of just a simple Q&A between Joss and the fans. Something a proud Browncoat can appreciate very much. Note: Browncoats are dedicated fans of the show, FIREFLY. The Dr. Who panel was also fantastic. I love the show. Being a Dr. Who fan in America can be a lonely pastime. Being in a room with thousands of people cheering and screaming for Matt Smith (the 11th Dr. Who) and Karen Gillan (Amy Pond, his companion) was a totally new and incredible experience. Anything else you’d like to share about Comic Con? I think it’s great that the actors, authors, and writers that speak on the panels seem just as excited to be there as us fans. It makes you feel like you have a real connection to these people whose work we love and admire. My lifelong dream is to someday be on a Comic Con panel promoting my own work. What about you? Did anyone see any of the YA or MG lit. panels at "The Con?" Many of the Comic Con Panels are available on YouTube. Browse and enjoy. Here is a post from DM Cunningham that guides you to the kid lit. panels. I’d love to hear from anyone who has a Comic Con story or aspiration. Hope to see you all there next year. I LOVE Doctor Who. I hope to someday attend Comic Con, sounds like so much fun! Glad you had a great time. It does sound like fun but I don't think it will ever be in my future since it's on the west coast! Lisa - Comic Con screams your name. Jess - Thanks. CC is crazy fun. Laura - Maybe CC will coincide with one of your future book tours and you can speak on a panel. I've never been to Comic Con, but I've heard great things about it. Until today, I didn't realize what a big deal it can be for MG and YA writers/authors. Someday I totally want to go and geek out. Stina - I'm thrilled that CC envelops kid lit. Lydia - If you need to get your geek on, "The Con" is the place to do it. Yeah Comic Con sounds like fun! Lee - Cameron will be glad to hear his "spidey look" got a shout out. Thanks Cameron for sharing, for getting to join the geek fun from afar! Julie - Goofy fans rule! Margo - I was wrecked missing that panel. Said awesome friends could also be spotted in Community costumes, Firefly costumes, True Blood, Harry Potter, and Hunger games attire. Yeah. I have awesome friends. Case in point: YOU! Leslie, thanks for recapping some of ComicCon as I didn't get to go either. Hopefully one day! Susan - I would love to see a Browncoat/bluestocking soiree. T - That's mondo cool. Thanks for the link. Awesome. I'd love to go one day. Oh gosh Leslie I LOOOOOVE Comic Con. I went for the first time 4 yrs ago (I think it was). I remember I got to see the first Twilight panel and they had no idea what the heck they had gotten themselves into. It was an absolute blast. Since I live on the east coast I haven't been able to go back but I plan on doing it again next year. I miss it and need my fix. What an atmosphere! Spiderman is my favorite too and you looked fantastic! Good for you. Medeia - Everyone should have Comic Con on their life lists. It never disappoints. Deana - Yay, you know the magic of "The Con." Talk about being in the right place at the right time for that Twilight panel. Wow. Next time you go, we'll hang out. Lee - Cameron sends a huge thank you for validating his version of Spidey. CQG - And a fine goal it is. I've already got my finger poised over the BUY button ready for next year's tix to go on sale. hey mrs.rose!My cousin and his girlfriend wanted to attend im not sure if they did ,but im glad you went. Hey back, Rylee. What a treat to see you commenting on the blog. You go girl! I can't wait for the day you have your own writing blog.